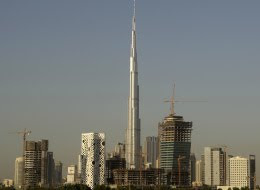 Yesterday, the United Arab Emirates, revealed Burj Khalifa, the worlds tallest building. The building stands at a total altitude of 2,684 feet. In a booming economy, one apartment, in this building could sell for as much as $3.5 million. The interior design of the tower, is done by Georgio Armani, which is his first imprint into real estate design. What a WONDERFUL way to enter the market? Click here for more info on the tower. Click here to see video on the blog. Link to see the video on source site.